Back home after one of the worst experiences I've ever had aboard a Shetland ferry. Wasn't sick, but only because I remained prone for the entire voyage. Well, most of it. When I wasn't trying to clear up the copious vomit of the (let's allow him anonymity) offspring in the bunk below mine. Problem was a vicious wee northerly wind, steep seas, the crap design of the NorthLink boats (flat bottoms - they're skips, not ships) and the cabin we had - the old crew accommodation in the bows. When it comes to pitching you feel everything. And another thing - the new flat-screen tellies/DVD players won't play DVDs in a storm. Two passengers had to be airlifted off by helicopter. Oh, it was a fun night. I had three hours uneasy sleep. I feel wretched about the mess in our cabin...but not as wretched as I did last night. Magnus has returned from Blackpool, where he was doing an intensive five-day driving course. I subsequently spent part of the weekend in the Berlingo's passenger seat while Mag conducted us about Knightswood and environs. He'll be ready for his test, which is booked for 7th August. If I don't have a heart attack first. We ate Japanese on Saturday night (Ichi Ban in Dumbarton Road - absolutely splendid) and then on Sunday it was farewell to Clydebank and up the road to Aberdeen. Mag drove part of the way. The only ugly incident of the trip took place at Stirling, where we had a Burger King. Actually, that wasn't as ugly as you might think. Whoppers are, weirdly, much smaller than Big Macs and much, much tastier. Gordon Ramsay is a Burger King fan and that's good enough for me. No, the problem arose when I tried to fill up with petrol in the adjacent garage. The driver of a newish Ranger Rover Sport (150 mph, 2 mpg) parked across two pumps to fill up his 4WD status symbol. I waited, then, when he had finished pouring about £300 worth of petrol into his machine, politely asked him if he could nudge the beast forward a couple of feet so I could fill the Berlingo with diesel. 'I'll be two minutes' the driver, who was tall and in his 30s, clearly some sort of property developer, said angrily. I shrugged, and, while he was inside paying, kicked in his tail lights. Alas, as you may have guessed,I did not kick in the Range Rover's tail lights. In fact, it never even occurred to me until just this minute. Instead, I made vile comments about every Range Rover driver I espied during the rest of our voyage to Castle Greyskull. As you do. Crap cars, anyway. Toyota Landcruisers are the thinking person's off roader. Very impressive indeed. The GAP Kids video is priceless, as is the Paul Newman 'Services to Salad Dressing' awards speech. I was seeking out a motorcycle repair shop called Gremlins today, and in finding Unit 10, Andrew Court, a hitherto unknown aspect of Clydebank's industrial life was revealed. At first sight, Clydebank looks as if its heavy industrial past has been all but erased in favour of shopping mania. I've been told the retail park, which includes all the usual suspects, ALDI, LIDL (my faves) Primark and more, is the biggest in Europe. The only reminders of the gigantic Singer sewing machine works is the name of a railway station and a pub. Back towards Scotstoun, BAE Systems are still welding together what look like prefabricated warships, but apart from that, the shipping and shipbuilding has vanished from the Clyde, to be replaced by what I believe will eventually be viewed as completely bonkers mass housebuilding on both banks. Horrible, cheap-looking flats that block the river from the public and exude shoddiness. Prices are already plummeting. Anyway, it's easy to forget that Clydebank suffered more than anywhere else in Scotland from German bombing during World War Two. The place is full of architectural anomalies: one minute beautiful Victorian villas, the next 1950s prefab housing. I found an old hotel yesterday, isolated amid a plethora of converted 50s factories. Clydebank was bombed to bits, lest we forget. But I also found the pulsing beat of industry. Dozens of workshop units, some small, some not so small. Making things, fixing things. Furniture; pakora; engineering bits and bobs. And among them, Gremlins, to which I consigned a Honda Silverwing. I hear Radio Clyde, which moved to Clydebank a quarter of a century ago in a fine fanfare, is moving back to Glasgow city centre. A shame. Crystal Cathedral...or The Ministry of Truth? 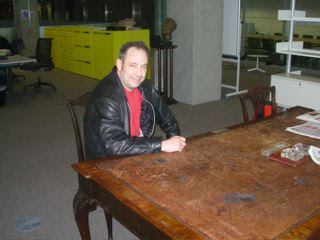 That's Lord Reith's desk I'm sitting at. Lord Reith, the man who made the BBC. Are the inkstains his responsibility, I wonder? George Orwell allegedly based 1984's Ministry of Truth on the BBC's London HQ at Langham Place, where that desk was once located. Room 101 actually existed among what was (and is, only with capuccino machines) a Kafkaesque warren in which people get lost for years. Before eventually reappearing with an idea for a reality TV show. Anyway, a tendency towards monolothic architecture among state broadcasters with a mission to manage a population is hardly surprising. The Reithian Beeb, and (in my own narrow experience) the South African Broadcasting Corporation both came up with forbidding buildings that shouted proudly about control. SABC's Jo'burg edifice was built to be scary, and is on a different scale from anythingin the UK. If you've seen Terry Gilliam's Brazil, you'll know what I mean. 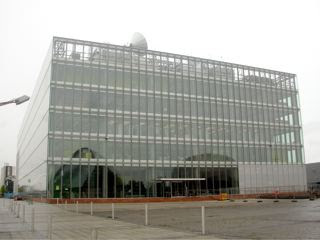 Anyway, BBC Scotland is half-moved, and by July will be completely flitted, to its brand new HQ at Pacific Quay, in Govan. 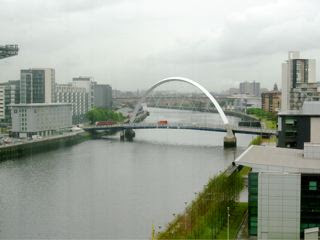 There is a Nuspeak element to the whole endeavour in its name: there never was a Pacific Quay; the site is actually Plantation Quay, and that area of the city is still known as Plantation, after the estate on which it was built. 'Plantation' is not a politically acceptable word, it seems. 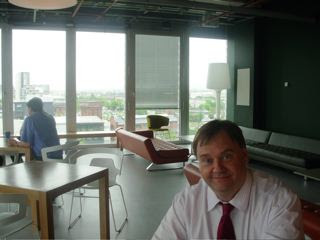 This week my boss Jeff Zycinski (pictured; incidentally, Jeff is based in his beloved Inverness) showed me round what is an undeniably impressive building, something which, at the very least, is purpose-built and does not suffer from the horrendously cluttered, shambolically extended feel the 'old' HQ at Queen Margaret Drive has. PQ, as we must call it, has fantastic views, easy access by public transport, bicycle and car, and uses the latest technology. 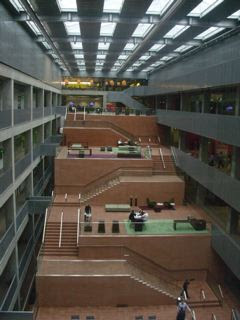 Its central atrium, with great red sandstone 'steps' rising gradually through its length, is breathtaking, if forbidding. And the giant banners hanging from its precipitous reception end are a mistake: Just too, too Soviet for comfort. There's already a couple of satirically Photoshopped pictures doing the rounds poking more than fun at them, which for the sake of my job I won't reproduce. And no, I didn't send them to the Sunday Herald, either. I'm not stupid. My own impressions were of a surprising hush. The vastness of what is called 'the street', that immense open space that immediately shrinks the visitor to the size of a gnat, with its hard surfaces in stone and metal, makes you expect harsh, echoing assulats on the ears. But the acoustics are absolutely brilliant and should work well with public performances. There's a central philosophy, though, which I disagree with. This building is designed to have an integrity with its equipment which truly makes it a machine for working in. But not living. The workstations and studios are part of its vision and structure, like a factory, and the humans who have to work them seem somewhat incidental: you may have an assigned desk, but we're in a hotdesking world, and you must not import plants, personal accoutrements, or pictures. There is (so far) no art. There are social areas for meetings and the canteen/bar is a magnificent piece of post-modern sixties 'modernism'. But there is nowhere to nest. Nowhere to hide or huddle. No corners and shadows where the mad, the bad, the dangerous and and brilliant can hatch plots and wallow in the fear and loathing which can give rise to great creativity. It's a clean, well-lighted place. Now, here's my theory: I think the reason that the 'old' BBC buildings like Langham Place produced the greatest programmes in broadcasting history is because they were so huge and warren-like they offered nesting opportunities for minds that would not otherwise find sanctuary anywhere. OK, dissension and gossip are bred in such places. Cabals are formed, machiavellian plots hatched, hook operators can breed. But the very oppressiveness of those buildings was somehow ameliorated by the fact that within them, you could find your own place of escape. There is something good about PQ's openness: you can simply wander in and see the likes of Jeff or the Controller, Kenny. They are accessible. The equipment is state of the art. But this is a digital building, and we are analogue people. I felt a bit like a seven-inch vinyl single in the Oxford Street branch of Game. I expect that PQ will, gradually, be humanised. Humans, after all, have a tendency to do that. At the moment, though, PQ feels like an enormously impressive factory. In absolute contrast, for example, to the Scottish Parliament Building, which is organic, flowing, messy, soft, woody and entirely focussed on the humanity of its inhabitants. And hey folks, that works a bloody treat, don't it? Very smooth trip down on the Hrosseyland last night, featuring for tea my first NorthLink baked tattie, which was...not disastrous. Manage to avoid the bar, the awful beer (no matter what, from bottle or tap, it all tastes foul aboard ship, and I have no idea why)and the worse red wine. Memo to self: remember kerry-oot next time. Weirdly, as I type this, I'm listening to a wonderful song called Wine Destroys the Memory by At Swim Two Birds...it's on the CD you get free with Word Magazine...anyway. Trick with the boats that go via Orkney is to nap for an hour as soon as get on board, then eat, then stay awake until after the ship has unloaded and re-loaded at Kirkwall. Because you sure as hell won't sleep through THAT racket. It's like having someone steam-hammer at your brain. Sound as a bell until 6.00 am, and out of the lower car deck into a brilliant blue and silver Aberdeen morning. Beans coffee shop opens at 7.00am, so that's where I settle with the papers to ease myself into what passes for urbanity. I become conscious of how scabby my old Wrangler jacket is (and I'm 51, for goodness' sake: should I be wearing such things? )and when M&S opens I check out something more salubrious. Jings! £45 for a jacket pretending to be even scabbier than mine! Deliberately defenestrated denim! And then an awful thought hits me: One reason for me being on the main land of Scotland is a charity dinner for the Vine Trust this Thursday, which I'm MCing. And the smartest clothes I have with me comprise (1)an ALDI waterproof climbing jacket (2) Raichle climbing boots (3)Columbus hiking trousers (4) A Delgados t-shirt. This calls for one thing: Primark! 9.00 am: Primark opens. 9.10 am, I have spent £38 and own a (perfectly fitting)linen suit, a new shirt, a silk tie and a belt. I have always wanted a linen suit, as I figure it will make me look a bit like a raffish Graham Greene hero. Tropical. Ideal for Shetland conditions. The climbing boots go suprisingly well with it. Oh, nearly forgot: caught a bit of the infamous John Sweeney Panorama doc about Scientology last night, including his now-legendary eruption into psycho-bawling at some Man in Black. Check it out. While Scientology is clearly (and rather frighteningly) far less convincing or appealling than its Battlestar Galactica spin-off, Sweeney's action seems to be utterly indefensible. And I'm confused by the BBC's apparent willingness to defend him, notably on Gloria Hunniford's Heaven and Earth show, where Panorama's editor appeared to do just that. For what it's worth, Sweeney's brand of overtly partial 'investigative' journalism, full of righteous anger and 'passion', has always seemed to me vulnerable to exactly this kind of ambush by his equally-exercised opponents. Lessons should be learned. By the Beeb. I fear organisations even less lovely than the Kirk of Science Fiction will already have been taking notes. Another great thumping carbon footprint imprinted on the peatscape of Shetland last night, as I had to Berlingo young Martha into Lerwick so she could catch the boat to Barcelona. Not that the NorthLink ferry goes directly to Spain, you understand. The voyage south to Aberdeen is just the first leg on the Brae High School trip to investigate the historical and cultural delights of the Catalan capital. And to spend a day or two at the Port Aventura theme park. Huh! In my day, it was a week at a disused army camp in Abington, Lanarkshire. Kids today! Various Morton offspring have enjoyed school-sponsored jaunts to Japan, Texas, Italy, Amsterdam, France, Alton Towers and, err...Edinburgh. While in Lerwick, I had a couple of mineral waters with BBC Radio Scotland boss and fellow blogger Jeff Zyciniski, who was on an official visit to BBC Radio Shetland. Much rejoicing in the Radio Scotland camp following yesterday's excellent RAJAR audience figures. Though individual presenters don't get to know how their own shows are performing until someone breaks down the numbers using various secret implements, probably including a sledgehammer. So all we on-air gobs on sticks stay in our usual state of rampant paranoia and jolly, confident fear...then we hire cars with louspeakers attached, like old-style political campaigners, and tour the streets, pleading in tinny voices with people to listen to our shows. Dammit, we have children to send to Barcelona! (Actually, the TM show's figures are pretty good, and my contract's just been renewed, so I don't pull my usual trick of falling at Jeff's feet weeping). No, we talk about this and that, Tony Blair's peculiar hair and how to keep Chinese takeaways hot when you have to carry them 35 miles home, as I was planning to do later in the evening. "Put them in the engine compartment" said Jeff "like we used to do with fish suppers." I look at Jeff in a completely new light. He is my boss. I will try it. Well, it may have worked with fish suppers (salt? vinegar? diesel?) but my honey-glazed crispy beef with egg fried rice tastes distinctly peculiar by the time I get home. Maybe it was was too near the exhaust pipe. Not everyone actually gets to taste their carbon footprint, I guess. Better than monosodium glutamate. Understandable, really, what with funerals, elections and everything else. Still, I am a bit concerned about, well, my lack of concern. It was the Shetland Folk Festival this past weekend, and I forgot about it. I can tell you, come to think of it, some of the names involved: Crooked Still, Sharon Shannon, Mary Black, Four men and a Couple of Hundred Fiddles. Doubtless a juggler or two. Why do folk festivals always have jugglers? Oh, and a truly colossal amount of drink. Maybe it was good. Maybe some of it was good, and some of it wasn't. Whatever, a large number of people will have had a good time. So that's....good. I was going to say I can't get excited about gigs any more, but as I've just paid scalpers' prices on eBay for two T in the Park tickets, that would be nonsense. For The Killers and The Hold Steady (not to mention My Chemical Romance for Ms Morton) I think it will have been worth it. If I remember to go. ....if only life were like the wondrous Napoleon Dynamite! And if you haven't seen it, rent, buy or download immediately. All will become clear concerning the Scottish Elections. Let me point you in the direction of the most insightful and wittiest commentary I have seen on the debacle so far: My BBC colleague Brian Taylor has a piece on the Beeb website which sets out the options and some of the controversies extremely well. And he's right about the ballot papers being cynically manipulated by the major parties. As for my opinions? Rerun the whole damn thing, I say. And as I said at the start, vote for Pedro. Do the dance, Napoleon!